Stuart Gibbs is one of my favourite authors of middle grade books. I really enjoy his JUNGLE FUN mysteries as well as these MOON BASE ALPHA mysteries. 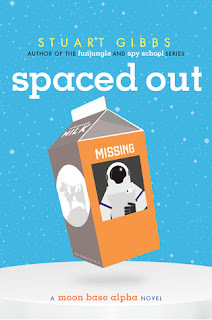 Spaced Out: A Moon Base Alpha Novel was written by Stuart Gibbs and published by Simon & Schuster Books for Young Readers in 2016. It’s a great mystery and a well-paced story with lots of action as well as the usual middle grade problems with bullies. I really enjoyed all the details about living in space in the excerpts from The Official Residents' Guide to Moon Base Alpha included with each chapter. I also loved all the unique elements that add to the fun of a story set in space. For example, you've probably never read a book before where a toilet is used for self-defense! This is a great example of a middle grade mystery with an interesting setting. I also thought the characters were realistically portrayed, and there’s a lot of humor in the novel through the main character’s voice in this first person narration. This is a great option to offer students who might be a little reluctant to read for pleasure. If you're learning about space, students could look for details in this book about life in space and do research to see if they can expand on them. A fun activity would be to try to draw their own plan of how they envision the base based on reading the book. Books in the Fun Jungle series by Stuart Gibbs include Belly Up, Poached, Big Game and Panda-monium. Stuart Gibbs also writes the Spy School series, including Spy School, Spy Camp, Evil Spy School, Spy Ski School. Spy School Secret Service is coming in October 2017. Sounds like a really fun book. And I've been into reading mysteries more. Thanks for featuring it. I enjoyed this one too. In fact anything from Stuart Gibbs will for sure engage you in a great story. I love Gibbs' super funny, throwaway lines. Just random things in the middle of a perfectly serious paragraph. He's hugely popular with my students! Sold! Just added it to my list. Thanks. My older son, who doesn't read much fiction but loves space, really loves this series. I need to read them myself. The next one looks intriguing as well! Oh, I love Stuart Gibbs books~ they're so much fun and so well-paced!